OMG! 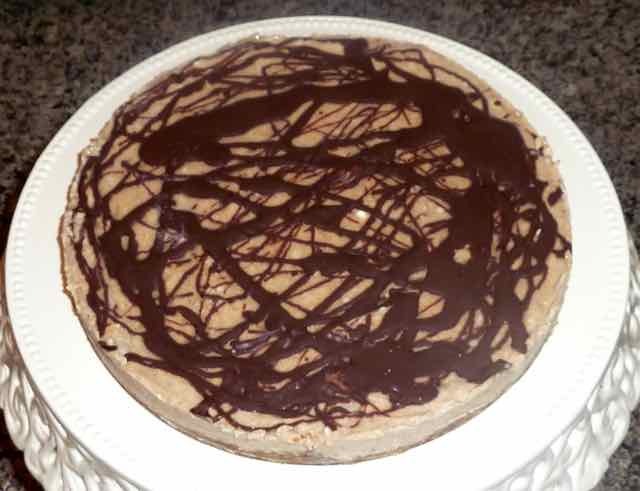 This pie tastes like a huge Reeses Peanut Butter Cup only healthier and with a creamy texture. This dessert is easy to make and no baking is involved. 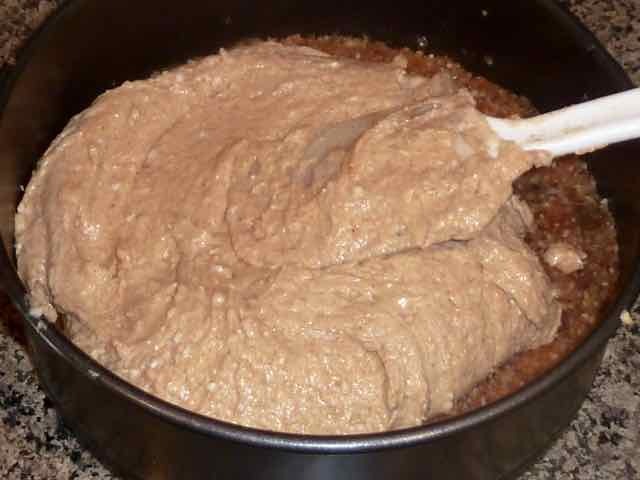 I am always looking for recipes that are GF, Vegan and Soy Free so that I can make just one thing for everyone in my family when we get together. For Passover this year I already had to make 4 different recipes just for the first course of GF matzo ball soup (vegan broth, chicken soup, vegan matzo balls with soy, and soy free matzo balls with eggs). Then there were two recipes each for both the appetizer and the entrée. You get the gist and can understand why I only made one dessert to fit everyone’s dietary needs. I made a walnut and date crust because I did not want to bake. The crust was pressed into the pan in a very thin layer. It went really well with the filling in both taste and texture. I think that a chocolate cookie crust would also go well with this recipe. 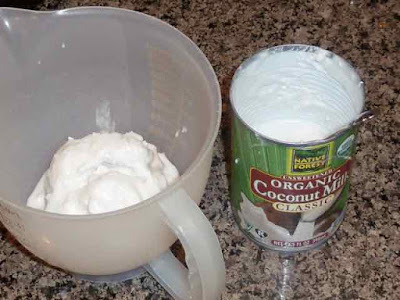 To keep the filling soy free I used coconut cream from a can of coconut milk (full fat) and whipped it up before folding the peanut butter into it. Very yummy. The pie was a huge hit! Everyone loved it. I made it a few days ahead and froze it. The tart thawed in the fridge while we were eating dinner. It came out much flatter than I expected. I wonder if I had served it fresh if it would have been fluffier and taller. At any rate it tasted wonderful and this recipe is a definite keeper. Evaporated Cane Juice Crystals Sugar - adjust amount to taste. 1) Prepare an 8” spring form pan by lining the bottom with a cake cardboard. If you do not have a special cake cardboard then cut a piece of corrugated cardboard to fit and completely cover it with aluminum foil before placing it in the bottom of the pan. It would be wise to lightly oil the foil to prevent sticking. It is not necessary to oil the cake board cardboard. Set aside. 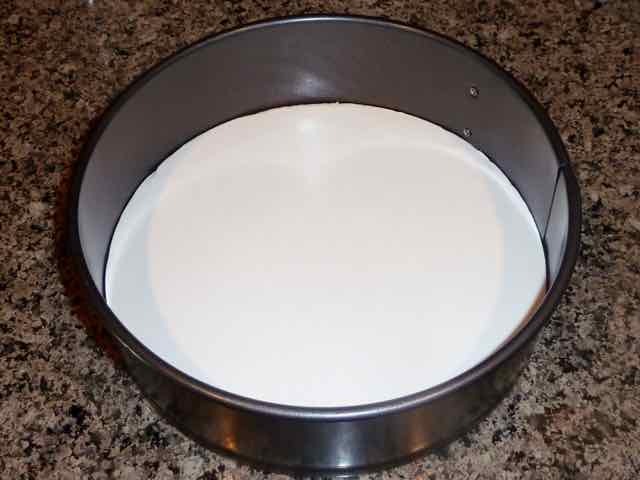 8" springform pan with cake cardboard on bottom. 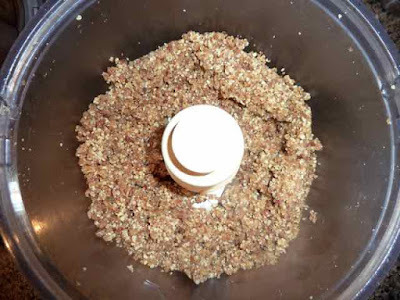 2) In a food processor add the walnuts and dates and pulse for 5 seconds at a time until the nuts are chopped fine and the mixture comes together. 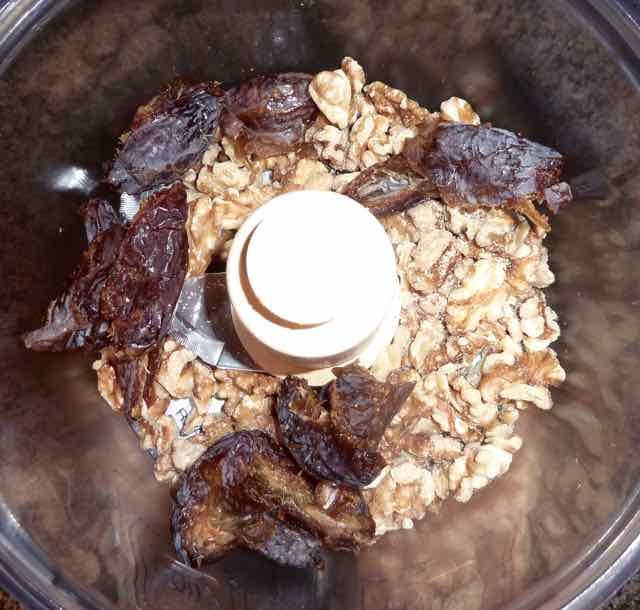 Nuts and dates in the food processor. Nuts and dates after running through the food processor. 3) Empty the contents of the food processor bowl into the prepared pan and using wet fingers press the mixture evenly all over the bottom. The nut date mixture pressed onto the bottom of the pan. 4) In a bowl add the hardened parts of the can of coconut cream (use the liquid part for another purpose) and sugar (and xanthan gum if using) and beat on high with a hand mixer until fluffy. and the liquid part in the can. 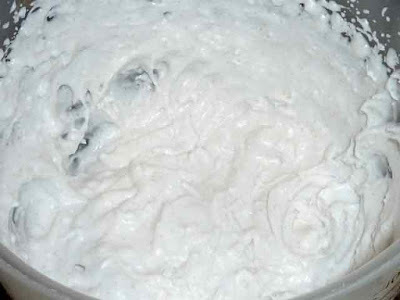 The hard part of the coconut whipped using a hand mixer. 5) Add the peanut butter and fold it into the coconut cream until well incorporated. Folding the peanut butter into the whipped coconut. 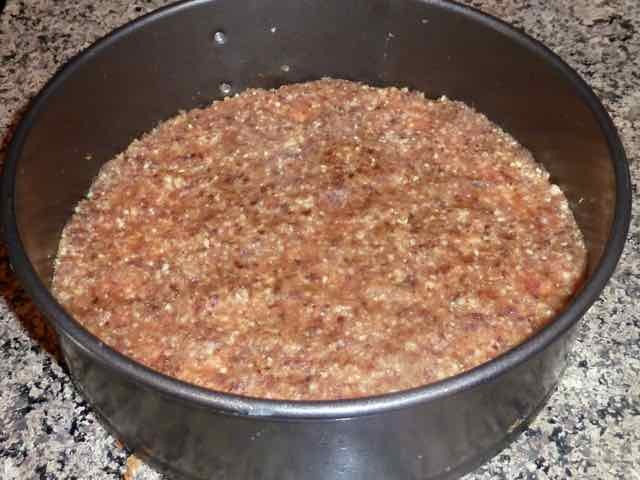 6) Pour the mixture over the crust in the springform pan. Spread it out evenly with a spatula. Putting the filling onto the crust. The filling spread evenly over the crust. 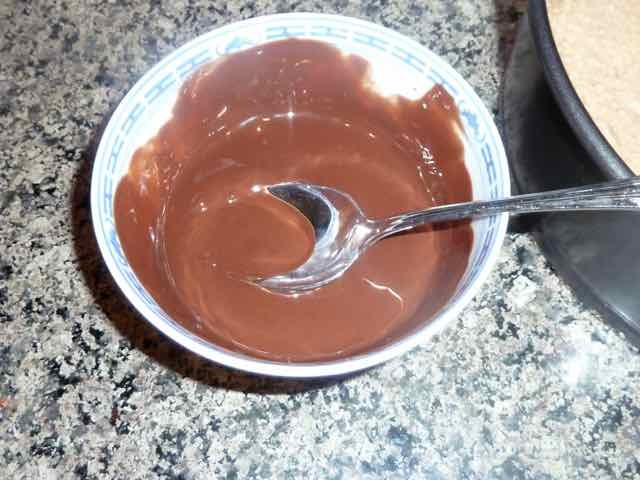 7) In the microwave or over warm water, melt the chocolate. Drizzle all the chocolate over the top of the pie. Melted chocolate drizzled all over the pie. I used a spoon to drizzle the chocolate. 8) It is best to let it firm up in the fridge before serving. It can be frozen if you want to make it ahead. Just thaw in the fridge for an hour before serving. 9) Run a thin knife around the edges of the springform pan before loosening the ring so that the tart will not stick to the sides. Transfer it, still on the cardboard, to a serving plate. The cardboard makes it easy to transfer and protects the plate from knife cuts. The pieces should serve easily if you use a cake server. 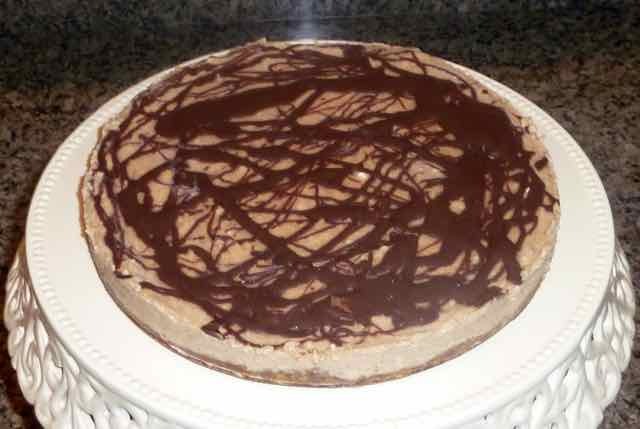 GLUTEN FREE VEGAN SOY FREE PEANUT BUTTER TART Makes one 8” tart glutenfreebakingbear.com CRUST Ingredients ½ cup	Walnuts ¼ cup	Medjool Dates FILLING Ingredients 1 13 ½ can	Coconut Milk - full fat Kept in the fridge for several hours or overnight 1 cup	Creamy Natural Peanut Butter (only peanuts in it) 3-4 tbs	Evaporated Cane Juice Crystals Sugar - adjust amount to taste. ¼ tsp	Xanthan Gum (optional) CHOCOLATE TOPPING Ingredients ¼ cup	Vegan Chocolate Chips Directions 1)	Prepare an 8” spring form pan by lining the bottom with a cake cardboard. If you do not have a special cake cardboard then cut a piece of corrugated cardboard to fit and completely cover it with aluminum foil before placing it in the bottom of the pan. It would be wise to lightly oil the foil to prevent sticking. It is not necessary to oil the cake board cardboard. Set aside. 2)	In a food processor add the walnuts and dates and pulse for 5 seconds at a time until the nuts are chopped fine and the mixture comes together. 3)	Empty the contents of the food processor bowl into the prepared pan and using wet fingers press the mixture evenly all over the bottom. 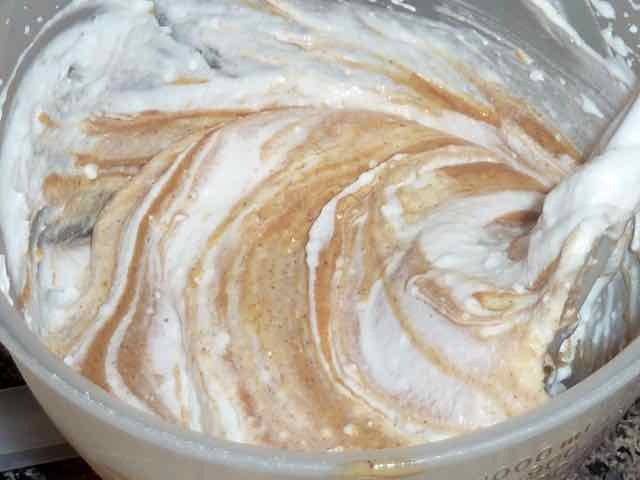 4)	In a bowl add the hardened parts of the can of coconut cream (use the liquid part for another purpose) and sugar (and xanthan gum if using) and beat on high with a hand mixer until fluffy, 5)	Add the peanut butter and fold it into the coconut cream until well incorporated. 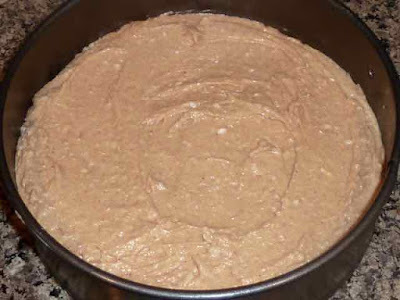 6)	Pour the mixture over the crust in the springform pan. Spread it out evenly with a spatula. 7)	In the microwave or over warm water, melt the chocolate. Drizzle all the chocolate over the top of the pie. 8)	It is best to let it firm up in the fridge before serving. It can be frozen if you want to make it ahead. Just thaw in the fridge for an hour before serving. 9)	Run a thin knife around the edges of the springform pan before loosening the ring so that the tart will not stick to the sides. Transfer it, still on the cardboard, to a serving plate. The cardboard makes it easy to transfer and protects the plate from knife cuts. The pieces should serve easily if you use a cake server. Thank you Bogdan! I hope that you enjoy the tart! 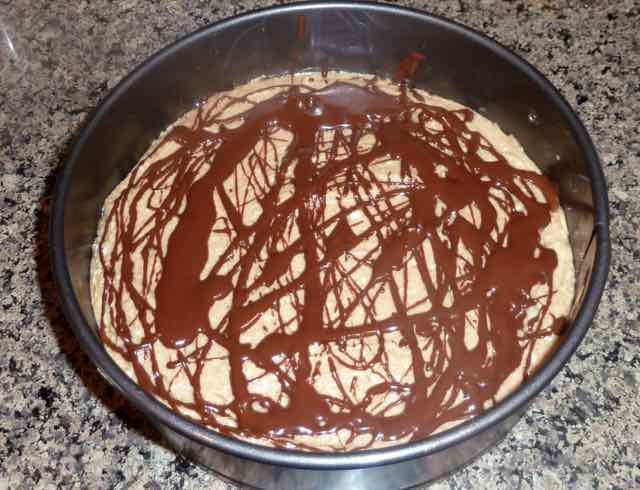 This is a no bake dessert! It needs a few hours to chill and firm up in the fridge or about an hour in the freezer. Hope you enjoy it!